More Fishing 411 TV??!! You Got It!! As Jake Romanack video tapes the action, Buzz Ramsey explains how to use in-line spinners like the Rooster Tail from Yakima for open water trolling applications. Spinners are a category of lures that covers a lot of ground. If you’re a bass fisherman the word “spinner” usually refers to a spinnerbait. The walleye enthusiast’s idea of a “spinner” is actually a nightcrawler harness. Talk to a musky guy about “spinners” and he’s going to be thinking bucktails! Among trout fishermen the term “spinner” focuses squarely on in-line spinners like the famous Rooster Tail from Yakima. These weighted spinners are designed for casting and nationwide they produce more trout than just about every other lure group combined! No one denies that in-line spinners are deadly when casted for all species of trout and salmon. But wait a minute.... What about trolling spinners for trout and salmon? If in-line spinners work so well for casting applications, it stands to reason they would also be good trolling lures. The truth is in-line spinners are good trolling lures, but not one fisherman in 50 has even thought of giving these baits a try in their trolling arsenal. Recently while fishing brown trout near Milwaukee, Wisconsin with legendary angler Buzz Ramsey we were enjoying exceptional action trolling the Yakima Mag Lip crankbait in combination with planer boards. Mag Lip is a deep diving bait and it works wonders for targeting trout and salmon suspended well below the surface. While trolling I notice Buzz was busy rigging up another line. Those who haven’t had the pleasure of fishing with Buzz Ramsey need to understand that part of what makes Buzz such a great angler is he is always changing things up. Never satisfied, Buzz is working the gear from daylight till dark. Buzz rigged up a simple three way swivel set up with a 12 inch dropper line to a two ounce sinker and a five foot leader terminated with a small round nosed snap. About 12 inches up the leader Buzz also tied in a small ball bearing swivel. After completing the rig, Buzz looked at me and asked, “got any Rooster Tail Spinners?” Normally I don’t carry my supply of in-line spinners when trolling, but on this particular day I did have a small box on board with a handful of Rooster Tails I normally use to cast for trout. Buzz picked out a 1/4 ounce version with a brown body and gold hammered blade. He attached the Rooster Tail to the round nosed snap on his three way rig, lowered it to the bottom and placed the rod in a saddle rod holder near the back of the boat. Before Buzz could even explain his logic, the rod bucked, doubled over and moments later Buzz stood holding a beautiful brown trout smiling from ear to ear. It was one of those “I told you so” moments but in this case the bait hadn’t been fishing long enough for Buzz to even explain his methodology. The long story shortened for the purposes of this blog, that single three-way rig with a small brown Rooster Tail ended up catching several more browns before the day was over. The experience opened my eyes and made it abundantly clear that spinners can be trolled in the right situations. 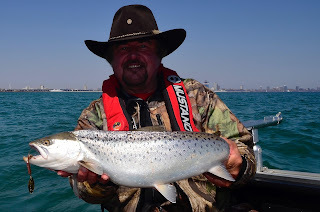 Trolling in-line spinners is a good presentation especially when trolling slowly for early season fish. It’s also a good idea to add a ball bearing swivel into the leader to eliminate line twist issues. Because the in-line spinners sink on it’s own, smaller 1/8, 1/4 and 3/8 ounce sizes are ideal for trolling applications. Three way rigs like the one described in this blog are best fished as flat lines straight out the back of the boat. 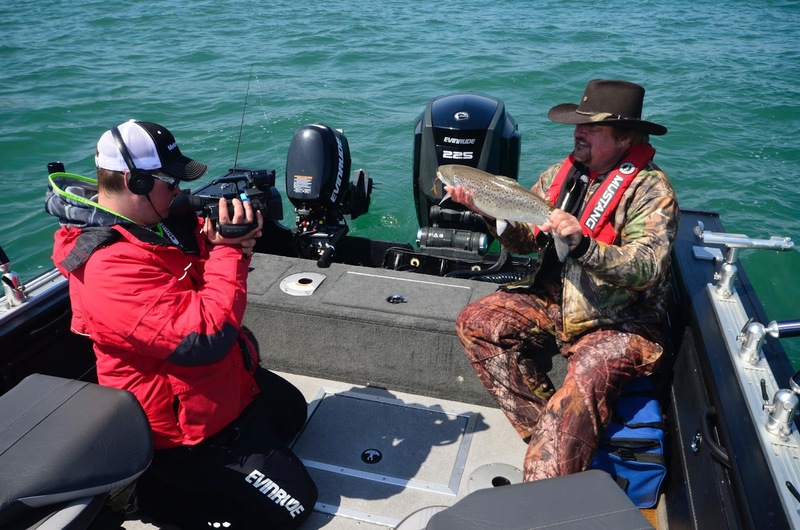 One of these three-way rigs on either side of the boat can and often does produce bonus fish trolling with traditional lures and planer boards would not have yielded. Because spinners have their own natural flash and vibration, they work well in combination with attractors like the popular Big Al Fish Flash. When using a flasher in front of a spinner a six to seven foot leader is best in clear water. For murky water conditions the flasher can be rigged four or five feet ahead of the spinner. Trolling with in-line spinners is another presentation to keep in your fishing “bag of tricks”. Not many anglers have tried it, but trolling with Rooster Tails has me convinced.